'I still dream about Anna London’s house. 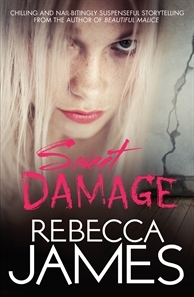 In Sweet Damage Rebecca James has produced an edge of the seat read. With mystery, suspense and romance this book is sure to have you turning page after page with tension, wonder and need to know. I had to withhold from turning to the back page to see the outcome. The cover of this book called me. I had other books to read but Sweet Damage kept looking at me. The cover itself speaks suspense and thrill. The evil, unknown look on the girls face and the questions she portrays had me wanting to pick Sweet Damage up and open the cover. This is a book that has all the callings of that of a best seller. Rebecca James writes with a passion for words and the ability to take a single sentence and twist it to leave you wanting more. Sweet Damage is full of unexpected drama and thrill. In Tim and Anna you find two main characters that you instantly relate to and understand. So different, yet so alike, Tim and Anna just seem to befit each other. Then there is Fiona and Marcus, helping Anna organize her life after the death of her parents just because they care, or is there a motive behind their friendship. Tim’s friend Lilla is happy for him when he finally moves out of her house into Anna’s house and encourages him to find his own two feet, or is there a sinister plan. Twists, motives and events take place within Sweet Damage when you least expect them leaving you wondering if life is really as we see it. Sweet Damage is the first Rebecca James novel I have read. With the success of Beautiful Malice I was aware of Rebecca James but never found myself being drawn to her book. Now I am hooked. I loved her style of writing and found I was lost within the first few pages. Sweet Damage is one of those books that I would read time and time again. It has a sinister habit of staring at me from my bookshelf. I am sure it calls my name.